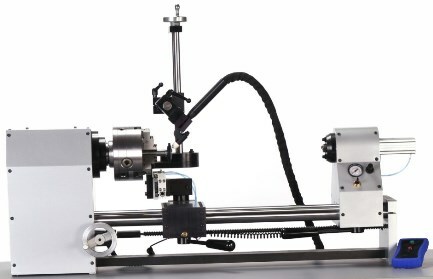 Full function welding lathe specifically designed to improve weld quality and consistency for TIG/GTAW, Plasma, or Laser Welding. Rugged headstock provides extreme accuracy of rotation. Tailstock has air advance/retract feature. Torch tower retracts for part load/unload. Lathe may be tilted for horizontal or vertical welding. Also available: TIG and plasma welding power supplies, plasma torches, and tungsten electrode grinders.